Today is my birthday! It’s a pretty simple affair – some cakes, some reading and then The Book of Mormon tonight. I dropped by one of my new favourite cafes – The Crux & Co – yesterday to treat myself to some birthday cakes (small, cute, and just the right level of sweet). They have a branch (the original) at South Melbourne, and I haven’t been there yet. This little one – just a little way down Little Collins St, nearby the Windsor Hotel and Parliament House – is just as nice. It’s cozy, it’s airy, it’s coloured in yellow and white and decked with all sorts of greenery. It makes a nice place to sit and have a coffee – close to the hustle and bustle of the CBD but far enough to offer peace and quiet. But the atmosphere of a place is always secondary (or more precisely, a bonus point) whenever I visit a restaurant or a cafe. The main thing – always, forever – is the FOOD. The DESSERT. I came here for the eclairs originally – small and aesthetic finger bites, and they have a huge array of colours and flavours. I would recommend trying at least one. They are pretty good. 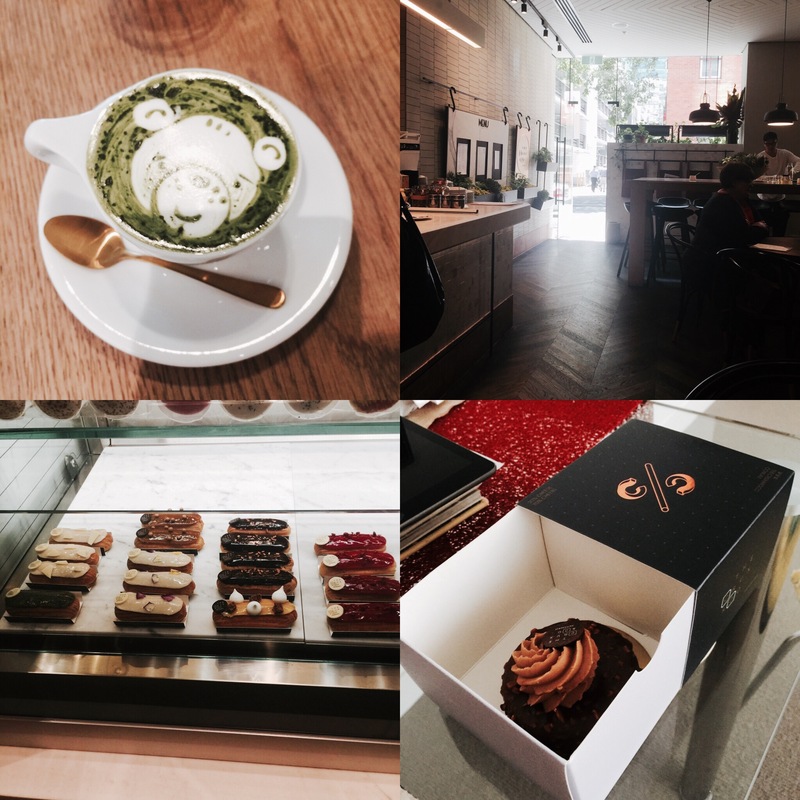 But what satisfies me – in terms of price (as a uni student) and gastronomical fulfillment – are their cakes. They are round deliciousness – with all the cakes I’ve tried so far they share a subtle sweetness. No element is too overpowering. And they are all cute! Well designed! What I like most overall is their hazelnut cake. I suppose the note I’ve written in the drawing is adequate in describing why personally it is above the rest. Dessert Run draws: the eclairs, the cakes, the crogels (not drawn; Croissant Bagels) and the absolutely adorable matcha latte.